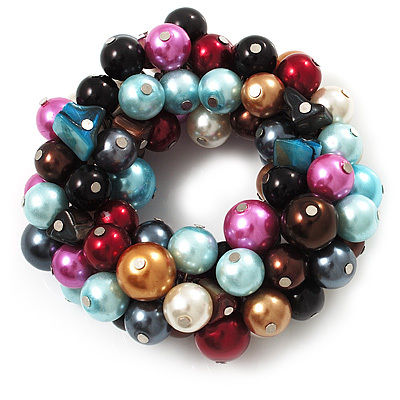 Enjoy natural style with this Chunky Multicoloured Simulated Glass Pearl & Shell Flex Bracelet. Featuring a chunky cluster design, made of multicoloured glass pearls and shell nuggets, offering a unique touch. Flex design slips over your wrist for easy wear (will fit up to 17cm). This glamorous beaded bracelet shimmers with pearlescent colour and brings effortless chic to any outfit.